Septic tank not working as it should? Unfortunately, even the best-maintained septic tanks and treatment plants fail and need replacing. Growing tree roots, old brickwork and shifting ground, for instance, can all cause irreparable damage to soakaways and pipework. If you move to an old or neglected rural property, you may have no choice but to fit a new system just to cope with modern life. If you need a new septic tank or treatment plant, we can carry out all the groundworks, including the fitting of soakaways and drainage systems. Our engineers can specify the best treatment plant for you and advise on where to locate it. In the past, people could go years without emptying their septic tanks. You can’t do that anymore. That’s because we now fill them up so fast with water from baths, washing machines and dishwashers. Not only that but the soaps, bleaches, detergents and cleaners we use stop sewage-eating bacteria from working. 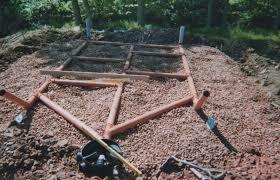 That means so solids and sludges don’t get broken down and build up to cause blockages. If your septic tank discharges directly into a stream, ditch or river, you have to replace it or upgrade to a full sewage treatment plant by 1 January 2020. If you are selling a property with an old septic tank like this you will have to replace it before you can sell. We can then carry out all the ground works as part of our complete septic tank installation service, liaising with the local council and other authorities to ensure your new system complies with building regulations and the Environment Agency’s new rules on the disposal of liquid waste and sewage. If you suspect you have a problem with your existing septic tank because of a smell, overflow or other telltale signs, call us. We can advise you on the best solution. 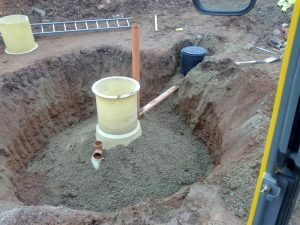 If you do need to fit a new septic tank or treatment plant, we can then carry out all the ground works and installation. We will liaise with the local council and other authorities to ensure your new system complies with building regulations and the Environment Agency’s new rules on the disposal of liquid waste and sewage. Find out more about our septic tank plant installation service, call us on 01432 353888 or email book@aquassist.co.uk.